Nvidia’s BFGDs (or Big Format Gaming Displays, to you and me) are no longer going to be called BFGDs. 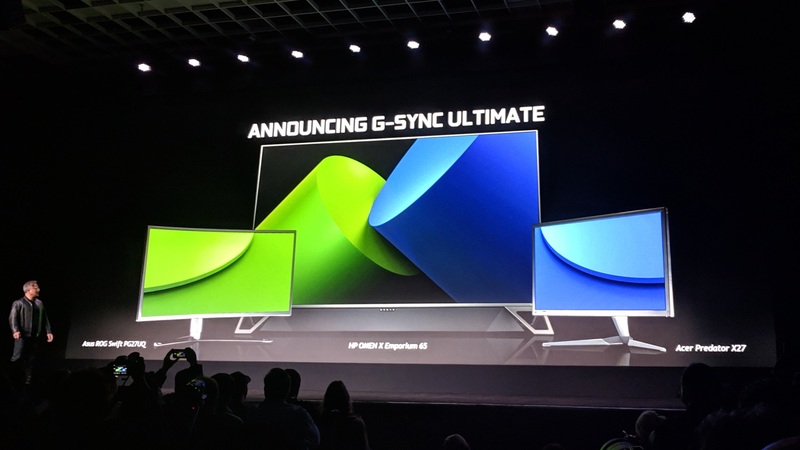 Instead, as of January 2019, these massive 65in gaming displays are now part of Nvidia’s wider G-Sync Ultimate family, which also includes their significantly smaller (but just as pricey) G-Sync HDR monitors such as the 27in Acer Predator X27 and Asus ROG Swift PG27UQ. Why the name change? To make things easier to understand, according to Nvidia, although between you and me I rather liked the idea of it being the BFG of all gaming displays. And one of them will be here super soon, too: HP’s newly-christened Omen X Emperium. If you’ve been eyeing up this jumbo gaming display, here’s everything we know so far about Nvidia’s BFGD G-Sync Ultimate displays, including their price (I’ll warn you now, it ain’t pretty), specs and release date. Nvidia BFGD: What are they and who’s making them? 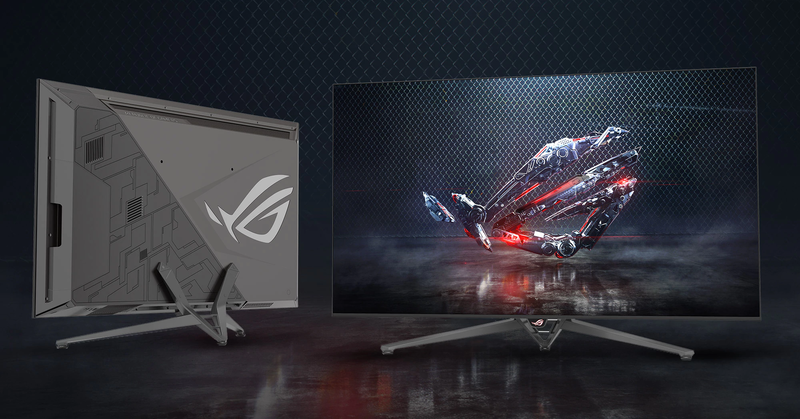 First announced back in January 2018, Nvidia’s BFGD G-Sync Ultimate displays are essentially the PC gaming equivalent of a living room TV – and they look as though they could be some of the best gaming monitors of all time. There are no doubt more in the pipeline from other manufacturers, but these ones will be the first to arrive on shop shelves. They all share the same specs and the same panel, so the only thing that’s really going to differentiate them is how much they cost and their overall design. We don’t know much about Acer’s imaginatively named BFGD yet, but we do have some early images of what Asus’ will look like as well as some actual real-life photographs of what’s currently going on with HP’s effort. The Asus ROG Swift PG65 has a traditional, TV-style shape, but remains an unmistakable student of the ‘gamer’ school of design. Asus’ PG65 appears to be quite a chunky old thing if the image above is anything to go by, recalling the early ‘flat-but-still-incredibly-thick-screens’ of yore. Just look at those giant vents on the top and bottom. HP’s Omen X Emperium, meanwhile, has changed quite a bit from its initial concept image (below). What was once slim enough to potentially wall-mount has now morphed into a rather chunky, soundbar-bearing beast. It’s a fraction more tasteful than Asus’ ‘l33t gamer’ design, but not by much as the rear still bears all the design hallmarks of HP’s Omen products, such as their Omen X 17 laptop, as well as a dash of RGB lighting for good measure. 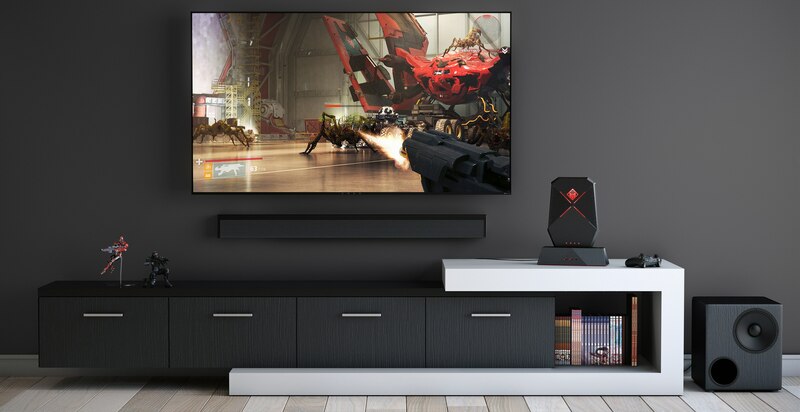 Just in case you didn’t realise the Omen X 65 was ‘for the gamers’, HP have kitted out their tasteful monochrome minimalist living room with their tiddly Omen X P1000 PC, a couple of gaming figures and a neat stack of manga to give it a bit of colour. You can still see the ghost of the Omen X Emperium’s original design when looking at it from the front, though, as here you can see some lovely slim bezels and a pleasing absence of ‘gamer-y’ embellishments. In fact, all you get is a small Omen logo in the centre. …although Nvidia tells me there will likely be another model without a soundbar on sale as well. The only Nvidia BFGD with a confirmed price so far is HP’s Omen X Emperium, which (brace yourselves) will cost $5000 with the soundbar (UK pricing is yet to be confirmed). Nvidia have also told me it’s likely there will be another model without a soundbar available, but there’s currently no word on how much that will cost by comparison, or whether it will even be available at the same time. Asus and Acer’s respective models, however, are still TBA. We can, however, take an educated guess. Given that Nvidia’s 27in G-Sync Ultimate displays such as the Asus PG27UQ will currently set you back £2300 / $2000, I’m going to take a very wild guess and say they’ll likely cost somewhere between $2500-$5000. Specific, I know. The design of the Emperium hasn’t changed much since Gamescom – it’s still massive and it’s still got that LED strip down the back, too. When Nvidia first announced their BFGDs, they tentatively said they’d be here in summer 2018. Well, it’s 2019 now, and so far we’ve only got a release date for one of them. That’s right, it’s HP’s Omen X Emperium again, which is due to arrive in February 2019. We might not have to wait too long for the others, though, as Asus have now listed the PG65 on their website (as of July 2018), suggesting it’s currently getting ready for release. There’s no information on its specs tab at the moment, or indeed anything that might suggest even the vaguest of launch windows, but it surely can’t be that far off. Watch this space. So what makes these BFG displays so damn expensive? Well, they’re massive for starters, measuring 65in across the diagonal. They also have a 4K resolution, but what really sets them apart from your typical telly is their giant 120Hz refresh rate, ultra low response time and G-Sync HDR support. That last one is particularly special. We’ve already seen the wonders and delights of what G-Sync HDR can do in the smaller Asus ROG Swift PG27UQ, and the three BFGDs should be no different in that regard. After all, G-Sync HDR is a fixed standard that combines Nvidia’s adaptive frame rate tech for smooth, tear-free gaming with HDR (or high dynamic range), so every display that supports it should deliver exactly the same kind of experience regardless of screen size. 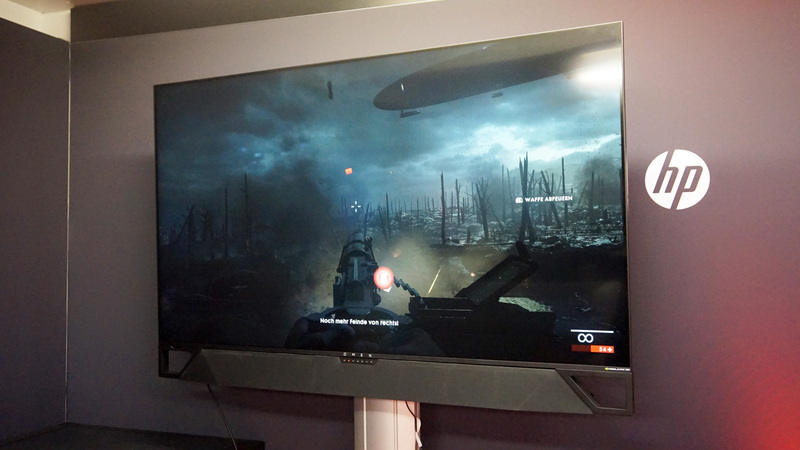 You can read more about in the ins and outs of what HDR is and what it means for your game library in our HDR on PC guide (as well as what graphics card you need for HDR), but from a specs point of view, G-Sync HDR more or less boils down to two main things: a peak brightness of 1000cd/m2 (the same as high-end Ultra HD Premium-certified TVs) for brighter whites and more life-like images, and DCI-P3 colour gamut coverage for more accurate, realistic colours. Each BFGD will also have its own Nvidia Shield streaming doodad built straight into the back of it, too. Yeah, yeah, big deal, you say. Hear me out, though. For me, this is one of the big coups of the BFGDs, as it technically means you don’t even have to have a PC connected to it in order to carry on playing your favourite PC games. That’s because, as well as being able to sit back and chill with a bit of Netflix, Amazon Prime and BBC iPlayer (and, if you’re in the US, Hulu and HBO) through the Shield’s Android TV side of things, you can also take advantage of its Nvidia GameStream and GeForce Now tech. 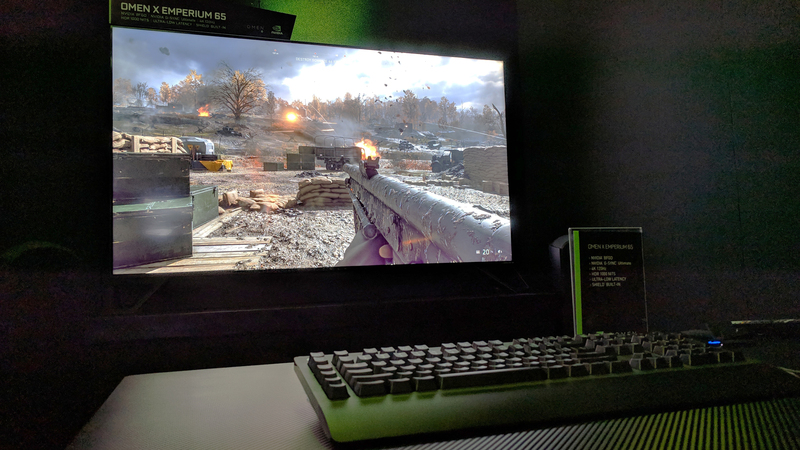 The former lets you stream games from another GeForce GTX graphics card-powered PC in your home, while the latter is Nvidia’s soon-to-be cloud subscription service (it’s still in beta at the moment) that lets you stream games you already own (and are included as part of the service) without owning any high-end hardware whatsoever. Of course, a large part of Shield’s streaming appeal will depend on a) the quality of your internet connection, and b) your willingness to potentially add yet another subscription service to your life. You may also hate the idea of cloud gaming with such a passion that you’re compelling to do a little vomit in your mouth every time someone mentions the phrase ‘cloud gaming’ (sorry) or look up at the sky. And that’s fine. Streaming isn’t for everyone. But it does open up the BFGD to those who might not necessarily be able to afford keeping their PC up-to-date all the time. It also means you don’t necessarily have to have a giant black box cluttering up your living room for people to spill drinks on, accidentally delete the contents of your hard drive, or generally get in the way of everything. 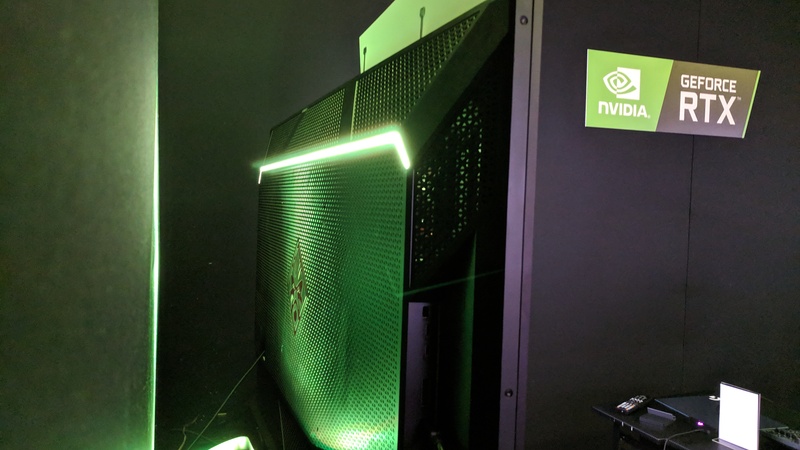 And that, for me, is a big plus when it comes to trying to play PC games from the comfort of my sofa – especially when a lot of the new Nvidia RTX graphics cards are so gosh-darned expensive.